Perhaps no other city in America came to life quite like Sparks, Nevada (population 81,673). The town, northeast of Reno, was custom ordered by the Southern Pacific Railway Company. In 1902, there was nothing but swampland and ranches four miles east of Reno. When the Southern Pacific succeeded the Central Pacific as the new owner of the main line across Northern Nevada, one of the first decisions made was to straighten the road and cut a few miles off the distance. The new route bypassed Wadsworth, which for 40 years had housed the roundhouse and maintenance shops of the Central Pacific. Southern Pacific made an offer to its Wadsworth employees: a tract of land would be laid out next to the new roundhouse, and the railroad would give everyone clear deed to a lot 50' x 140' in size, pack up every house in Wadsworth, and ship it to the new town, free of charge. The new city was incorporated in 1905. After the railroad departed in 1957, Sparks’ economy shifted to tourism and gaming, and the city soon became a major regional warehousing and distribution center. A walking tour of Sparks’ downtown Victorian Avenue includes 13 historical buildings, two parks, an amphitheater, and a replica of the old Southern Pacific Depot. 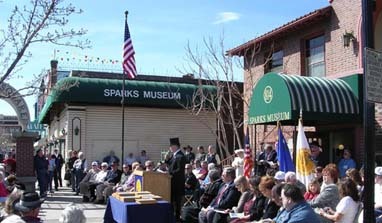 The Sparks Heritage Museum is housed in two historic buildings, the former Hale’s Drugstore and the Washoe County Sparks Library, with exhibits that detail the town’s progression from a train depot to a mining hub to the fifth-largest city in Nevada.